COLUMNA MESSIANIC RESEARCH CENTER: Did You Know That You Can Obey God's Commandments, Yet, Still Guilty of Disobedience? Know the Proper Sequence of Obeying God! Did You Know That You Can Obey God's Commandments, Yet, Still Guilty of Disobedience? Know the Proper Sequence of Obeying God! In God's viewpoint, the proper sequence of actions and events are very important. The Great Creator God is the First of all, the Source of Life and everything Good, the origin of all Blessings. He is the First Cause of all causes, the Creator of all creations. Our obedience to His Laws and Commandments must also follow the right order and sequence for us to benefit from GOD's many blessings. Adam disobeyed God by eating first from the prohibited Tree of Knowledge of Good and Evil, Adam acquired the Knowledge of Good and Evil via SIN or Disobedience, and against the WILL OF GOD. Adam, then, was disqualified to eat from the TREE OF LIFE, which has the WILL OF GOD THE FATHER (Genesis 3:22). IF YOU START WITH #2 INSTEAD OF #1, WHAT WILL HAPPEN? If you start with #2, this means that #2 is disconnected from and not supported by #1. This means that #2 cannot sustain itself, because #2 exist only because of #1. Number 2 is called #2 because of #1, otherwise it is not #2. It is impossible for #2 to exist without #1. Therefore, if #2 will try to stand by itself, without #1; it will evaporate and self-destruct to non-existence. In other words, it will ultimately die. After eating from the forbidden tree Adam tried also to eat from the Tree of Life. But this is not the right sequence. The damage has already been done, and Adam at this early history, fresh from the sin, is now disqualified to eat from the Tree of Life. So, God forced Adam to get out of the Garden, and assigned a Cherubim with revolving sword of flames, to prevent access of Adam and his offspring to the Tree of Life (Genesis 3:24). But sadly, what happened in the Garden of Eden is the reverse. Man had chosen to go the other path by eating first from the Tree of Knowledge of Good and Evil. And because of that sin, the Yetzer Hara saturated man, and he has to be purified from that sin. When a person violates the order that God instituted in His world, he disrupts the flow of divine vitality to himself and the world, and endanger the sanctity of his body and soul. YET STILL GUILTY OF DISOBEDIENCE. WHY? A series of related shots that constitute a complete unit of action in a movie. Music: A melodic or harmonic pattern successively repeated at different pitches with or without a key change. Any improper sequence of shots in the movie, or any wrong sequence of notes in a musical composition, will result in bad performance. Let's have the following verses as an example (Matthew 22:37-39). If you obey Matthew 22:39 first, or you obey Matthew 22:39 more than Matthew 22:37, then you are committing the sin of IDOLATRY, even though it appears that you are a very loving person to your neighbors! 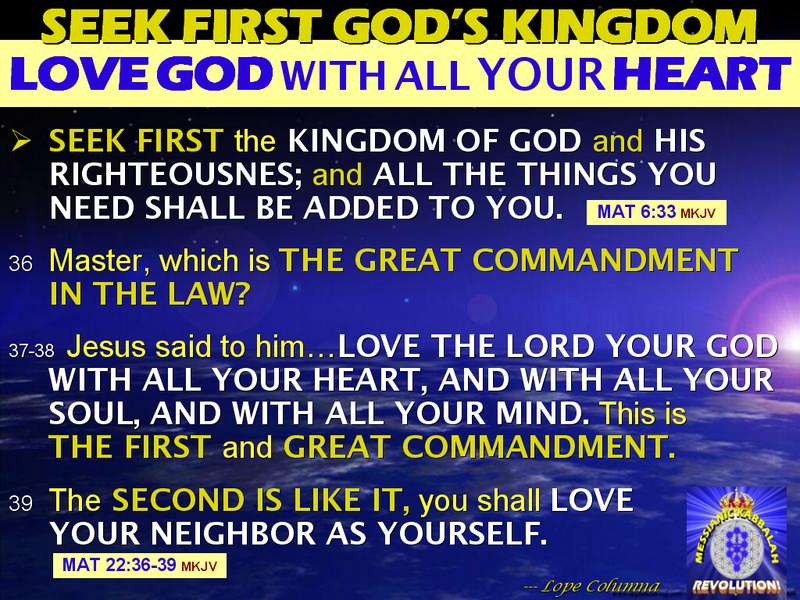 The proper sequence of obedience is: LOVE GOD FIRST, then love your neighbor next. Loving your neighbor first, and loving GOD second, is still a sin. It is even a great sin of idolatry! The flow of Authority and Blessings also has the proper sequence and direction. Blessings flow from above to below, not from below to above. 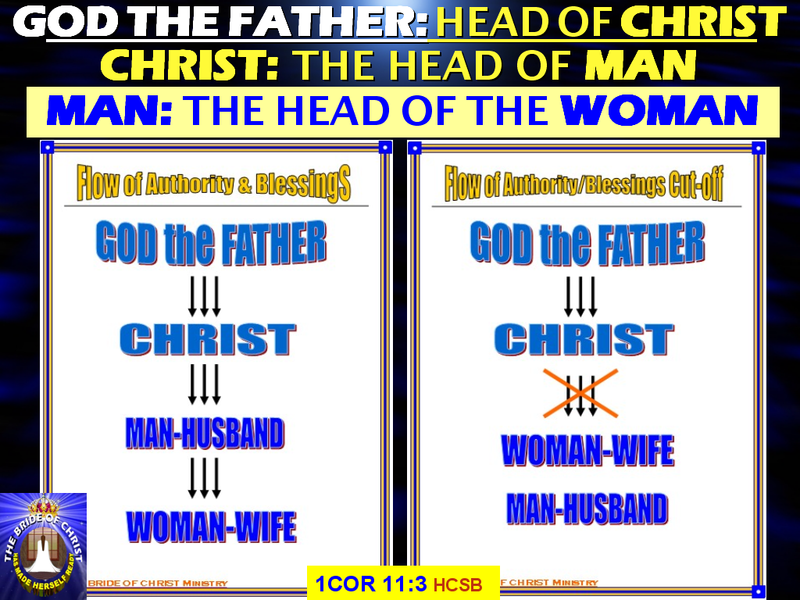 The best example of this is shown by the flow of Authority and its corresponding Blessings in the Marriage and Family relationships and Government (1Corinthians 11:3). The flow of blessings from above is either opened or closed depending on our actions here below. The results of improper sequence that will surely lead to disastrous effects are blessing stoppage (curses) and disconnection. Sometimes the worst effects can happen: breakage, destruction, or death. The destructive effect could happen either in an instant or after some delayed time. But the overall effect is the same: Man became mortal, and he is now subject to pain, sufferings, and death. Even before his birth, pain and death can take a hold on him, and after birth he begins to suffer pain, hard labor, sufferings, sorrows, destruction, and finally death. 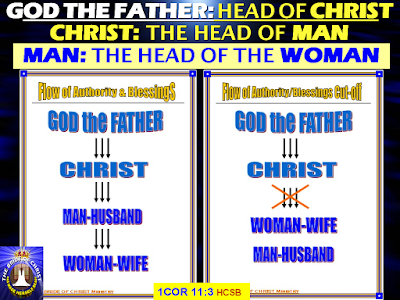 Continued on: THE PURPOSE OF BIBLE STUDY IS TO UNIFY GOD'S NAME. It Can Be Done Only Via PARDES (The 4 Levels of Bible Knowledge). Failure To Do This Explains Why Man is Advanced in Technology, but Backward in Religion and Morality.